With the exception of a giant octopus painted on the kitchen’s back wall, Gather Kitchen & Bar aligns with current industry aesthetics. 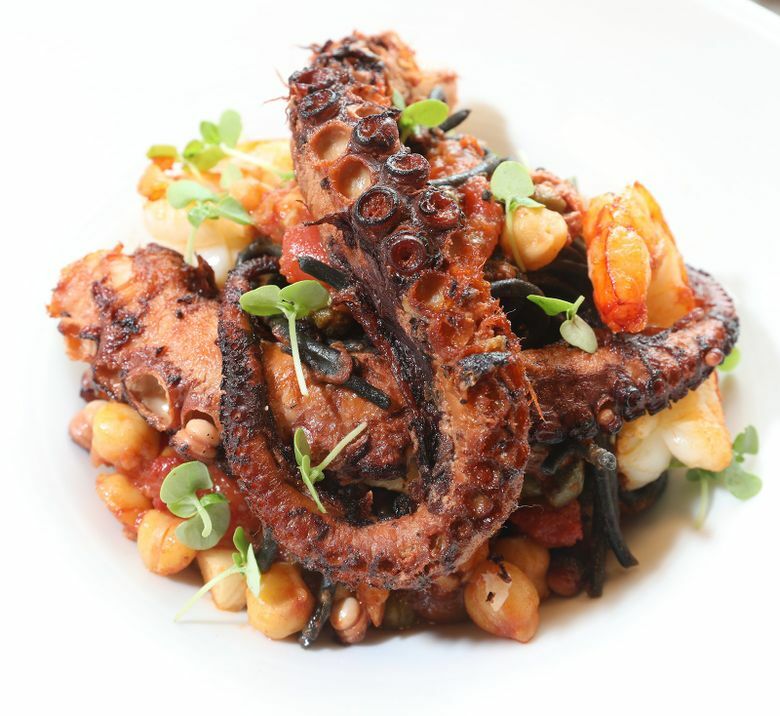 Below the outstretched arms of that octopus, the heads and shoulders of cooks are visible bobbing and weaving as they prepare the small plates and large that servers encourage diners to share. The dining room has black-and-white checked curtains on the windows, white subway tiles and weathered wood on the walls, and a polished cement floor. Schoolhouse-style pendants cast diffuse light on rough tabletops made of reclaimed wood. They are hazardous terrain for long-stemmed wine goblets and elegant coupes filled with cocktails that sometimes sound more interesting than they actually taste. The restaurant anchors one corner of The Commons at Ballard, a new mixed-use development across from the library. The man in charge is Ryan Donaldson, chef/owner also of Redmond’s Stone House, an intimate, 32-seater he opened nearly a decade ago in a building more than a century old — a throwback to another restaurant era. Donaldson lives on the Seattle-side of the lake and spends most of his time now at Gather, which he opened in early October. The initial press release says he “drew inspiration from his travels to the high-end pintxos bars of San Sebastian and memories of festive Thanksgiving dinners at home.” The result is a menu that’s a bit all over the map, though like the décor, it does not blaze any new trails in the gastronomic forest. Gather is more of an upmarket, contemporary rendition of ye olde neighborhood bar and grill — though it may be too upmarket even for Ballard. Prices skew high: $31 might set a record for half an organic roast chicken. Sharing holds down the cost. Small plates are generous and some large plates come in two sizes. Or go at happy hour from 4-6 p.m. when all the small plates are $3 off, a deal that isn’t just limited to the seven seats at the bar. I had some very good dishes at Gather, others that were just so-so and a couple that were simply dreadful. Let’s start with the best. Take a cue from that mural and order the squid-ink spaghetti with octopus, shrimp and garbanzos. The light tomato broth is delicately sharp and briny with olives and capers. Wild mushroom confit smothered a boneless rib-eye so tender they don’t even bother giving you a steak knife. Star anise and clove percolate through the tomato-y house steak sauce. The rib-eye is one of the dishes offered in two sizes: $38 for about 14 ounces; $72 for about 28 ounces. 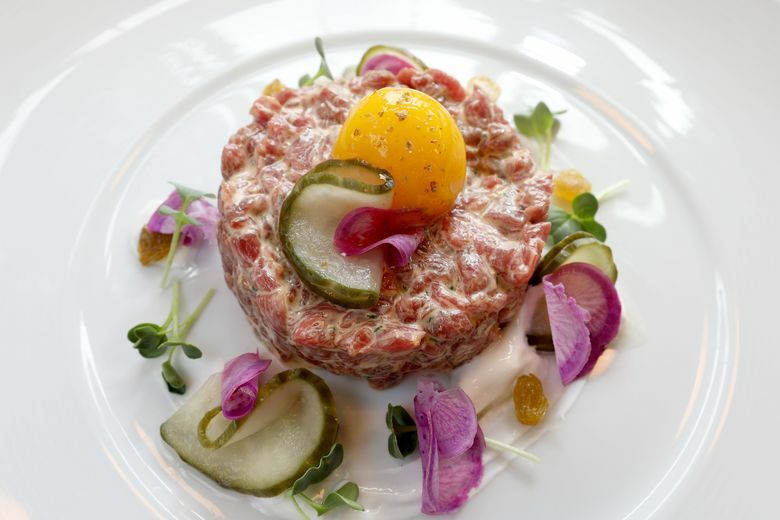 From the roster of small plates: Lamb tartare reveals a smidgen of sambal that, along with capers, mustard and mint, reins in the richness of those egg-yolk-slicked pearls of coarsely ground raw meat. A foamy blue-cheese emulsion clings to fried cauliflower in a hot-sauce-tinged batter. Meant as a vegetarian riposte to Buffalo wings, the cauliflower reminds me more of Indian pakora and comes with wonderful bread-and-butter pickles. Mussels bask in red coconut curry — or would if they weren’t crowded into a cute pot that’s too small and deep for easy access to the vibrant broth. Parisian gnocchi pair with beef short-rib ragu, a happy union that fell short of perfection only because the pate a choux dumplings were not as crisply sautéed as they should have been. The kitchen has a tendency to leave out key ingredients. A gratin of scalloped potato and celery root had no trace of the promised Gruyere, so tasted flat. Roasted carrot and Parmesan risotto was likewise lacking cheese, letting the sweetness go unchecked. Some edits seemingly made on the fly work; others changed the dish entirely. The tartare did not come with “harissa pickled cucumber raita,” but a few house pickles and a scribble of coriander yogurt seemed a reasonable substitute. Lemon tart with blueberry compote arrived topped with goat-cheese whipped cream, instead of Chantilly cream. Goat cheese should not be a surprise ingredient. I would also argue it doesn’t belong on a lemon tart. Desserts generally did not inspire much enthusiasm. An apple terrine was dry and dull, even with caramel sauce. Hot, crisp, airy beignets were weighted down with warm lemon-curd filling. The disastrous dishes occurred on a Saturday night when the restaurant was catering a large private party upstairs in The Commons’ amenity room. Over the course of the evening, a tall trolley made repeated passes through the restaurant bussing trays from the front door to the kitchen. Though done as discreetly as possible, it was disruptive to diners, like trying to sneak a giraffe through the dining room. The kitchen was possibly overstretched, undersupervised or just distracted, but they weren’t on top of their game. The smell of burnt garlic hung in the air. Its acrid flavor permeated a lemon, caper and artichoke sauce that could not revive an overcooked, flaccid-skinned arctic char fillet, or mask its fishy odor. A salad came with limp, watery clumps of flaked crabmeat that smelled less than fresh, too. It would have been smarter to 86 the salad than serve it with subpar crab. An unfortunate night for a restaurant critic to drop by to be sure, but as critics will do, I went back. Twice, in fact. I had that salad again. It was a joy to eat. Sweet lumps of crab gamboled with Granny Smith apple, cara cara orange, roasted beet, baby greens and micro-herbs in a verdant pasture of creamy Green Goddess-like tarragon vinaigrette. Other diners who’d had the same initial experience I did might not give that restaurant a second chance. Something to think about.